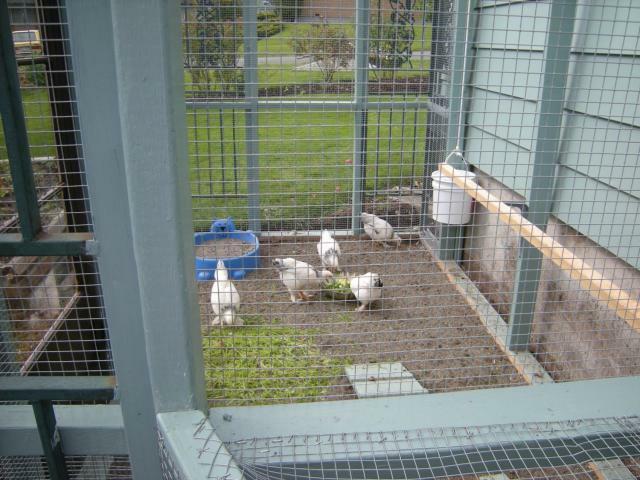 The photo above shows my current backyard flock of six Light Brahma hens (#6 is hiding somewhere out of the photo) that were raised from day-old, feed store chicks. As of this writing (June 2010) they are 3 months old and very nearly full grown. These are BIG girls and some of the nicest birds I've ever had. These Brahmas have a very sweet, calm, and people-friendly personality. They don't get daily handling and, yet, I am able to pick any one of them up and put them into the lap of one of my grandchildren with little protest. When these girls were about six weeks old, I inadvisedly decided to acquire two more chicks - a Rhode Island Red and a Blue Laced Wyandotte. I say "inadvisedly" because when these two girls were ready to leave the brooder, they were far too small to safely integrate with the Brahmas, so at 7 and 6 weeks respectively, they are free-ranging in the garden and spending their nights cooped up in my greenhouse. It isn't the optimum solution, but so far it's working without ill effect on the garden or on the birds. I am lucky in that our small town has an extremely competent and well-respected Animal Control Officer who has been very successful in curbing the dogs-running-at-large problem we had a decade ago. So, with the very small risk of a wandering dog attacking the little girls, there's very little in the way of daytime predator risks I have to be concerned with. We do have hawks and bald eagles that make their home here on the island, but my yard has a good deal of vegetative cover where the little girls can find sanctuary. Nighttime predators are foiled by locking the girls away in the greenhouse.